Happy Solstice! Happy New Year! Happy Happy! I’ve been hard at work on revisions and had The Plague for about ten days. I’m just now easing back into life. One good thing about being ill is I could keep a close eye on the feeders and bird bath, and so caught lots of fun activity. 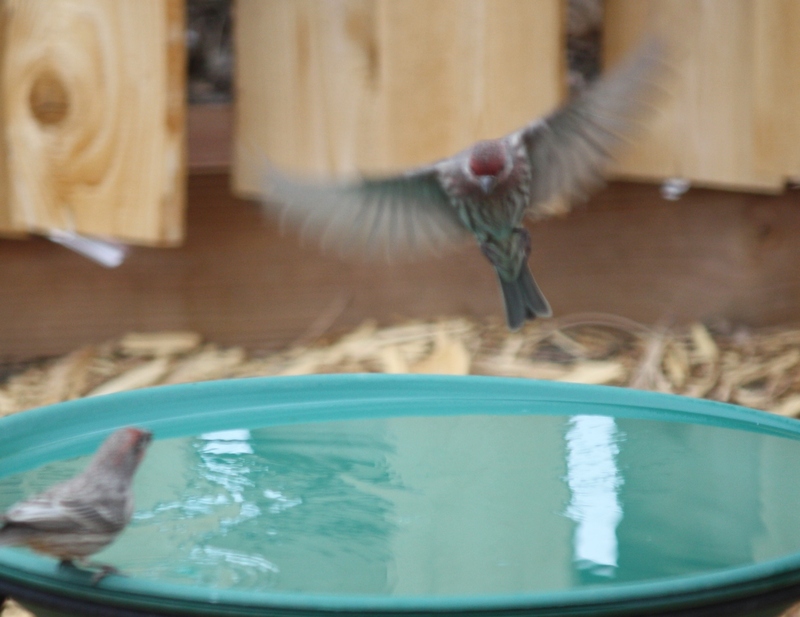 Here’s a finch-in-flight in front of a fellow finch. 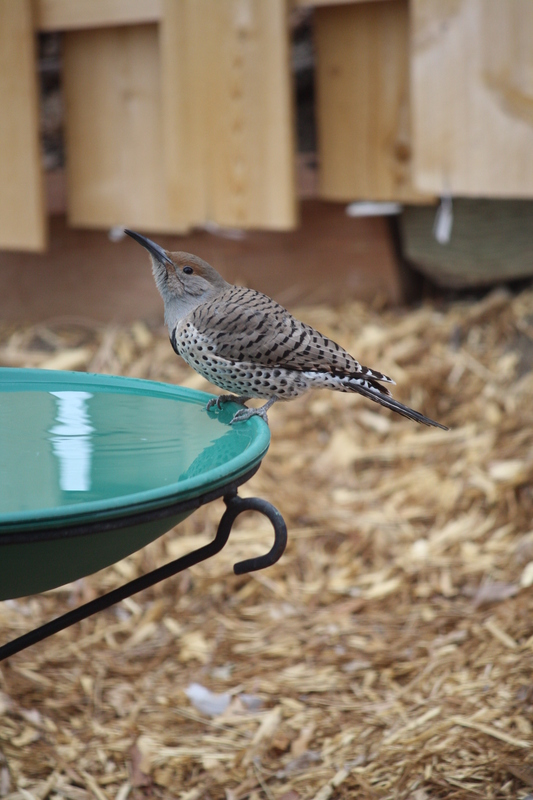 This is our first winter with a heated bird bath and it was the best investment for our feathered friends, especially when temperatures were below zero early this week. I’m always so happy when someone drops by for a drink. The other day I was working at the table next to the window overlooking the main feeder, the many finches, chickadees, juncos, etc. chirping away, when I became aware of SILENCE. I looked outside and there was not a bird to be seen. Not a one. I scanned the power lines for a predator, and finally located a hawk at the very top of our old maple tree at the other end of the yard. I was craning my neck for a better view when it took flight. Within a minute, birds began to reappear out of the plum bushes behind our fence, reminding me of the Munchkins in Oz. So sorry to hear you had the Plague! But I think you put your time to good use. Beautiful photos — and I love the very idea of a heated bird bath. Our poor birds here could use one. It’s been a cold and snowy January, so we’ve been putting out food (and they’ve been harvesting the last of the garden berries), but they still look dazed. I’m sorry your January has been harsh; I always worry about those out in the elements. I just read in my Audubon magazine that chickadees spend the nights shivering, burning a huge amount of fat, because of their body type. It’s excellent you have berries for them to harvest.